Wheaton Tissue Grinders enable primary cells to be prepared from excised tissues, as well as sub-cellular components from harvested cell packs. 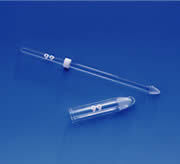 Tissue grinders are used to extract DNA, RNA and proteins for blot or other procedures. They are also used to enhance recovery of other cell products. Capacities on the grinders range from 0.1 ml to 55 ml. There are many grinders to suit your needs. Tapered Tissue Grinders are ideal for connective tissue including heart, muscle, and lung. These glass-on-glass grinders feature a long taper design that minimizes grinding efficiency. Potter-Elvehjem Tissue Grinder incorporates a serrated pestle design to disperse homogenate into the mortar cylinder. 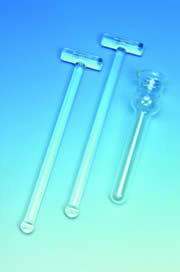 Standard unit with Teflon® pestles are well suited for soft tissue, such as brain and liver. Tenbroeck Tissue Grinders have a hollow handle that allows packing with ice, making them suitable for tissues such as liver, intestines and heart. Dounce Tissue Grinders are supplied with two types of pestles: a loose-fitting pestle for sample reduction and a second, tighter pestle for complete homogenization. The ball-shaped pestles leave cell nuclei intact in soft tissue. 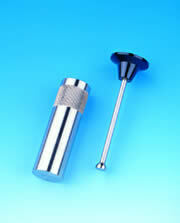 The Wheaton Micro Tissue Grinder Kit offers a complete selection of micro tissue grinders. All Wheaton tissue grinders are manufactured from Wheaton 33 low extractable borosilicate glass that conforms to USP Type 1 and ASTM E-438 Type 1, Class A requirements. Replacement parts can be purchased separately. This grinder designed to retain a high percentage of cell nuclei and mitochondria in soft tissues from cell cultures. When use, the pestle ball is encircled in liquid, which is avoid heat buildup by reducing friction. This grinder is ideal for enzyme studies. The initial grinding is performed using the "loose" pestle. The grinding process is completed using the "tight" pestle.. This grinder is used by moving the pestle up and down, and work best with cell suspensions or very soft tissues. The mortar has a large reservoir and pouring lip and is supplied with "loose" and "tight" pestles. Wheaton Dura-Grind® Stainless Steel Dounce Tissue Grinder provides a rugged alternative to glass Dounce tissue grinders. Smooth pestle action requires less effort than glass tissue grinders. This unit is precision machined of No. 316 stainless steel to the tolerance of 0.0005 in. (0.013mm). The mortar has flat bottom allowing it to stand upright. Single pestle and mortar are supplied as a matched set; they are NOT autoclavable. Weight 2 lb (0.9 kg). These grinder are precisely constructed with completely interchangeable parts to allow easier cleaning or replacement of damaged mortars. 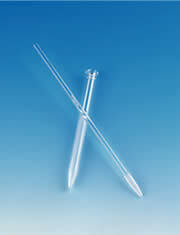 They are designed for use in preparation of tissue homogenates and other similar applications. 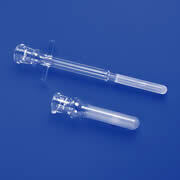 The Teflon pestle is for soft tissues such as brain or liver. 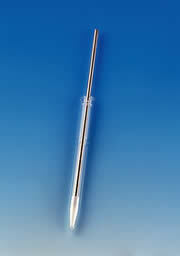 The stainless steel rod is 0.25" (6.3mm) diameter. The grinding chamber clearance is 0.004" to 0.006" (0.1 to 0.15mm). This unit is autoclavable and can be used for power homogenization as with overhead stirrer. 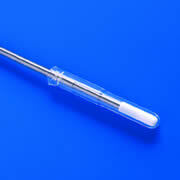 However, we strongly recommend the use of safety-coated tissue grinder (64793-series) for added safety. 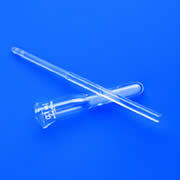 This unit is manufactured from Wheaton 33 low extractable borosilicate glass that conforms to USP Type 1 and ASTM E-438 Type 1, Class A requirements. This grinder has a serrated PTFE pestle that disperses homogenate into the mortar cylinder more efficiently. Depth of the serration is 0.20" to 0.25" (0.1 to 0.15 mm). Wheaton Safe-Grind plastic coated tissue grinders afford an added measure of safety over uncoated glass tissue grinders. The heavy plastic coating protects the mortar from becoming scratched or checked, and assures you of grip. The transparent coating allows an unobstructed view of the homogenate during grinding. The grinders are fully autoclavable. Similar to the all glass Potter-Elvehjem style, but micro size is for extremely precise work. This unit is designed for delicate hand operation. Clearance between pestle and tube is 0.004" to 0.006" (0.1 – 015 mm). This is new design grinder with longer tapered surface on both the mortar and pestle, offering grinding more efficient and less time require. The conical surface allows initial size reduction followed by passage through the cylindrical section for the final homogenization step. The components are interchangeable. Therefore no need keep parts matched during cleaning. The ground glass surface on both the mortar and pestle are capable of homogenizing connective tissue such as heart, muscle and lung, as well as skin and plant tissue. This unit is the same as the 64796-series, but with a Teflon® pestle for soft tissues. 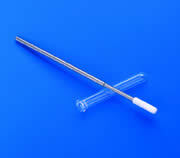 The stainless steel rod is 0.25" (6.3 mm) diameter and is suit for use with Wheaton Overhead Stirrer. This complete selection of Wheaton Micro Tissue Grinders is conveniently packed in a lightweight protective carrying case. 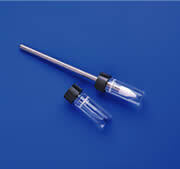 The 0.5 ml micro tissue grinder with screw cap can be used for tissue grinding as well as for additional procedures. 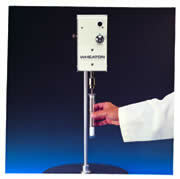 This particular tissue grinder mortar can be safely joined with another threaded glass component if needed, using the Wheaton Connection®. The Kit is packed in high-density polyethylene case with foam inserts. All glass Tenbroeck tissue grinders are precision made, interchangeable pestles and tubes, no need to keep to keep component matched, also offer easier replacement of damaged parts. The clearance between pestle and tube is 0.0035 to 0.0065" (0.09 – 0.16 mm)While this grinder is designed for hand operation, it can be slow speed motor-driven by inserting a rubber stopper (side 00) and metal rod into pestle. This unit also features an expanded reservoir and pouring lip. 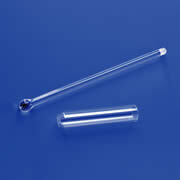 This unit consists of finely ground glass pestle and tube. The mortar and pestle come as matched set. This unit features a screw threaded neck for use with Wheaton connection®. The 13-425 cap has an open top and Teflon® faced silicone rubber liner. The clearance between pestle and mortar is 0.002 – 0.006" (0.05 – 0.15 mm).